The agitating students have called off their street demonstrations until March 28 against the death of a fellow in a road accident in Nadda area of the capital. A 10-member student panel made the announcement on Wednesday afternoon after holding a meeting with Dhaka North City Corporation Mayor Atiqul Islam. “We’ve decided to postpone our movement until March 28 after Mayor Atiqul Islam accepted our demands,” said Tawhid Uz Zaman, leader of the student panel. “We’ll sit with the mayor on March 28 to know about the work progress. If we’re not satisfied, we’ll go for movement again. We want safe roads, safe Bangladesh,” he added. Hundreds of students from different universities and colleges went on the street movement on Tuesday, shortly after the news of the death of Abrar Ahmed spread fast. On Wednesday morning, the protesters blocked roads in Shahbagh, Tejgaon Industrial area, Progati Sarani, Farmgate, Mirpur and Old Dhaka. A large number of students took position on the accident spot and chanted slogans, “Action, action, direct action”. Traffic came to a halt in the area due to the road blockade by the protesting students. DNCC Mayor Atiqul, DMP Commissioner Asaduzzaman Mia and BUP Vice Chancellor Major General Md Emdad-Ul-Bari came to meet the demonstrators around 11:00am and laid the foundation stone of a footbridge on the accident spot. The footbridge will be named after victim Abrar Ahmed, they said. They talked to the protesting students and assured them of fulfilling their demands as soon as possible. But the students vowed to continue their demonstrations as their longstanding demands remain unfulfilled. Later, they withdrew the road blockade in front of Bashundhara Residential Area in the evening. 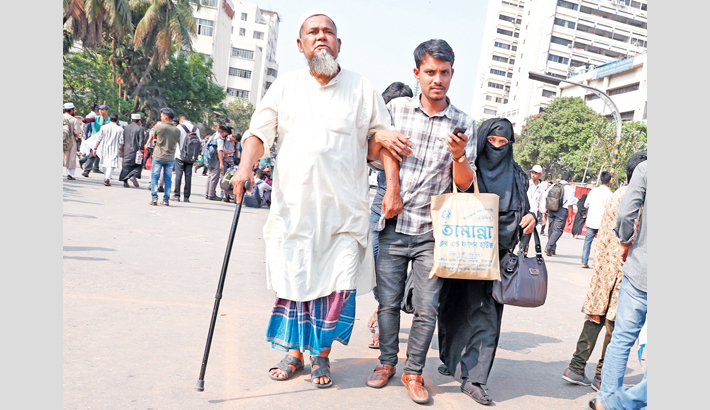 Hundreds of students blocked Shahbagh intersection around 11:00am on Wednesday, inflicting sufferings on commuters. The protesters were seen holding various placards and the national flag and shouting: “We want justice and safe roads”. DUCSU Vice-President Nurul Haque Nur expressed solidarity with the protesting students. He urged the authorities concerned to withdraw all cases filed against students during the road safety movement. The student leader sought Prime Minister Sheikh Hasina’s interference into fulfilling the students’ demands. Students of different colleges tried to block Farmgate in the morning. Students put blockades on Ray Shaheb Bazar intersection in Old Dhaka around 9:45am, creating huge tailbacks in the area. Road was also blockaded at Science Laboratory and Dhanmondi 27 on Mirpur Road. Huge traffic jam was created on Mirpur Road, Dhanmondi and Satmasjid Road. “The bus service of Supravat Paribahan has been kept off for now and that the route permit of the killer bus has been cancelled” he added. Meanwhile, a case has been filed with Gulshan Police Station in the capital over the death of Abrar Ahmed. The victim’s father, Brig Gen (retd) Arif Ahmed Chowdhury, filed the case on Tuesday night, police said. The driver of the killer bus has been made the prime accused while his helper, the owner and contracting firm made accused also. The High Court on Wednesday directed Supravat Paribahan to give Tk 10 lakh within seven days to Abrar Ahmed’s family. The court also issued a rule, asking the authorities concerned of the government and Suprobhat Paribahan to explain why they should not be directed to compensate Tk 5 crore to the family of Abrar for his death in the road accident. The HC bench of Justice Md Nazrul Islam Talukder and Justice KM Hafizul Alam issued the rule following a petition filed by Supreme Court lawyer Barrister Ruhul Kuddus Kajal.